Handling of Personal Information - SunFlare Co., Ltd.
SunFlare Co., Ltd. handles a wide range of personal information, including the following: our clients’ personal information; personal information on our external resources; and personal information on SunFlare Academy students. 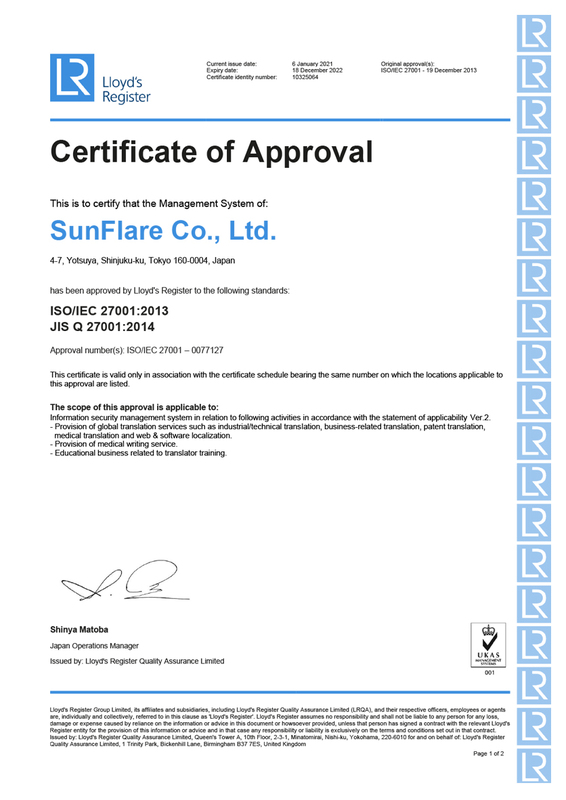 SunFlare Co., Ltd. ensures the following: that all officers and employees that work for and at the Company are fully aware of the rules for personal information protection; that they handle personal information in an appropriate manner in accordance with the fundamental policy below; and that they fulfil what is expected of our Company based on its reputation. The Company will comply with Japan’s Act on the Protection of Personal Information and other related laws, ordinances and standards so as to ensure the implementation and maintenance of a management system for the protection of personal information and will strive to improve such system on an ongoing basis. The Company will acquire appropriate personal information giving due consideration to the details and scale of each translation/documentation project and shall ensure that such information is provided only to the extent necessary to achieve the purpose for which such personal information is to be used, and will implement the necessary measures so that usage for other purposes does not take place. The Company will appoint a person responsible for personal information management in each division/department handling personal information, establish a system to appropriately manage such information, and strive to ensure that the Company’s officers and employees are thoroughly familiar and comply with the Company’s regulations. The Company will handle personal information within the specified purpose of the use thereof. In addition, the Company will not disclose or provide personal information to any third parties unless the relevant individual has given consent thereto or there is any due cause for such disclosure or provision. The Company will keep personal information accurate and up to date, will strive to protect personal information from hacking, data breaches, loss or destruction, etc. and will improve and correct its information security on an ongoing basis. The Company will respond to inquiries (including complaints and consultations) and requests disclosure from customers and other parties with respect to personal information promptly and in good faith. 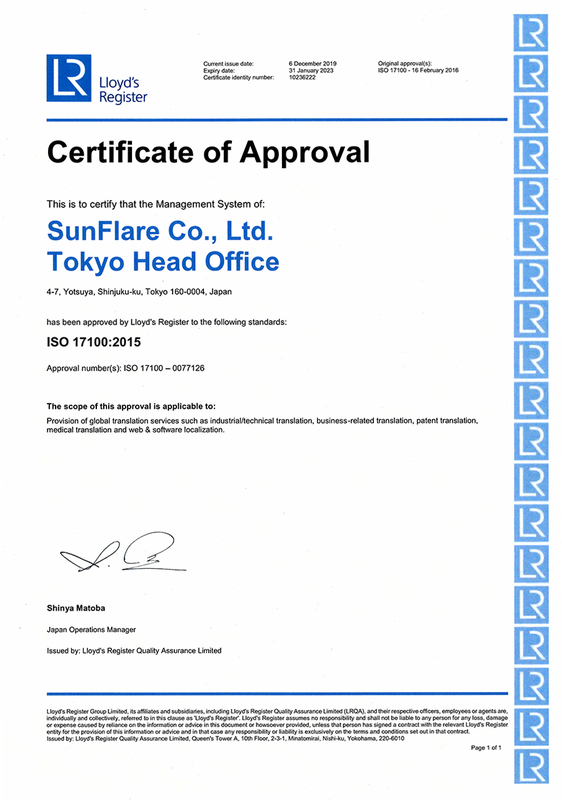 SunFlare Co., Ltd. uses personal information to the extent necessary to achieve the following tasks and utilization purposes as listed below. Furthermore, excluding cases in which doing so is necessary to protect life and/or property pursuant to laws and regulations, the Company shall not use personal information for purposes other than those that for which notification has been given in advance and consent thereto obtained. Information (names, contact details and resume) on project managers, translators, interpreters, DTP operators, etc. recruited on the SunFlare homepage. 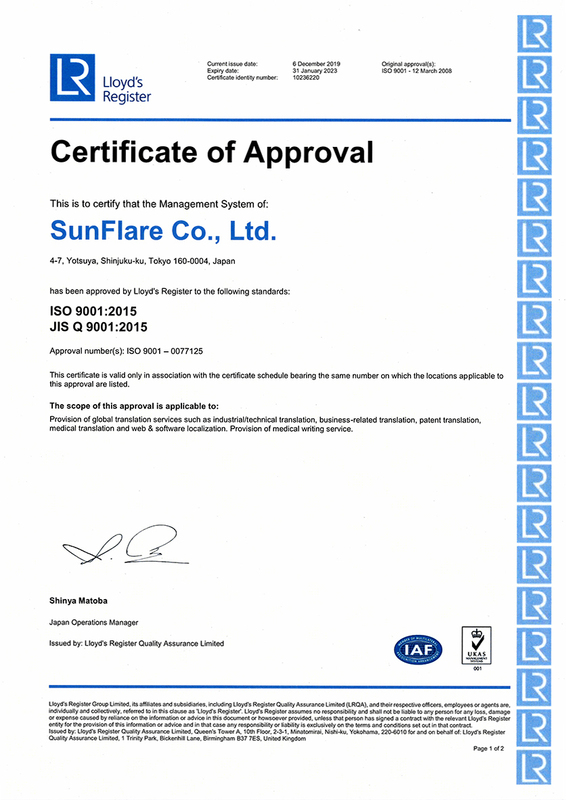 The administration of the joint use of received personal information is carried out by SunFlare Co., Ltd. The processing of personal information will on occasion be outsourced to ANDROMETEC Co., Ltd. or another appropriate third party processor. The Company is a company subject to JIPDEC, an accredited personal information protection organization. If you have complaints and consultations in relation to personal information handled by us, you may directly address to JIPDEC using the contact information below.